People dressed up in silly costumes, especially when they’re all grown-up, tend to make me feel extremely uneasy. Yes, even when they’re dressed up as princesses and fairies… So imagine when they choose to impersonate creepy characters such as dead people, zombies, vampires, monsters, crazy doctors, ax murderers, etc. BRRRRRRR! Sends shivers down my spine just thinking about it. If I had my way, I would totally hide under a rock on Halloween day and just wait there for it to pass. 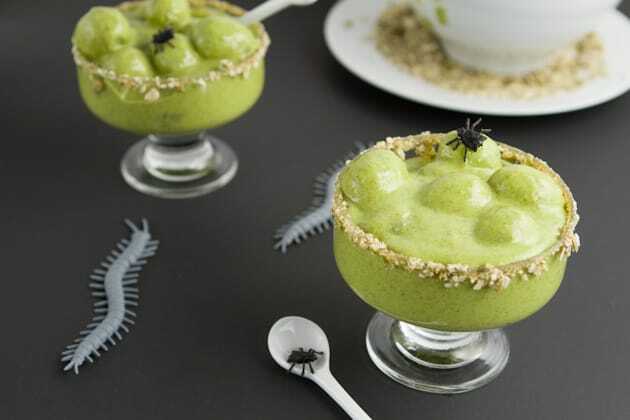 Hey, some of the recipes I found are so cool, I think I may end up giving them a try them myself… just for the spooky fun of it! 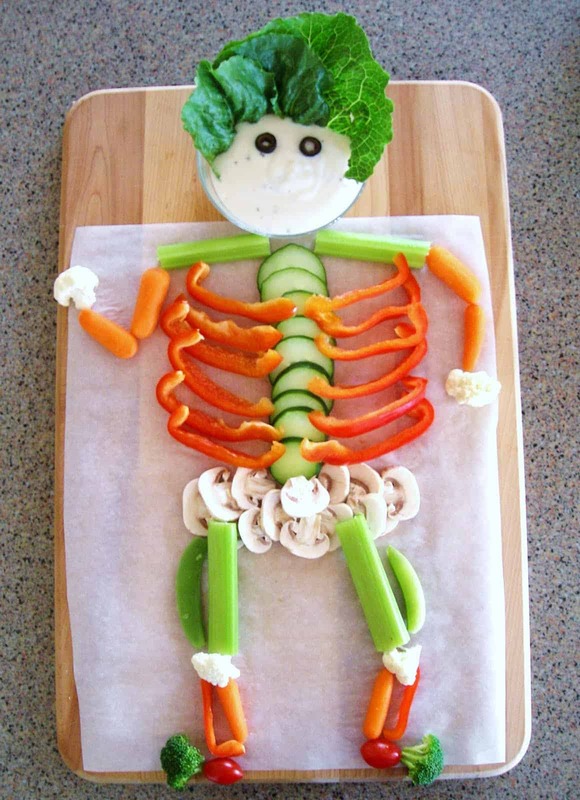 How adorable is that little veggie skeleton guy? What kid wouldn’t want to eat THOSE veggies? Halloween or not, I know I would totally go for them! The only question is… what body part to eat first? 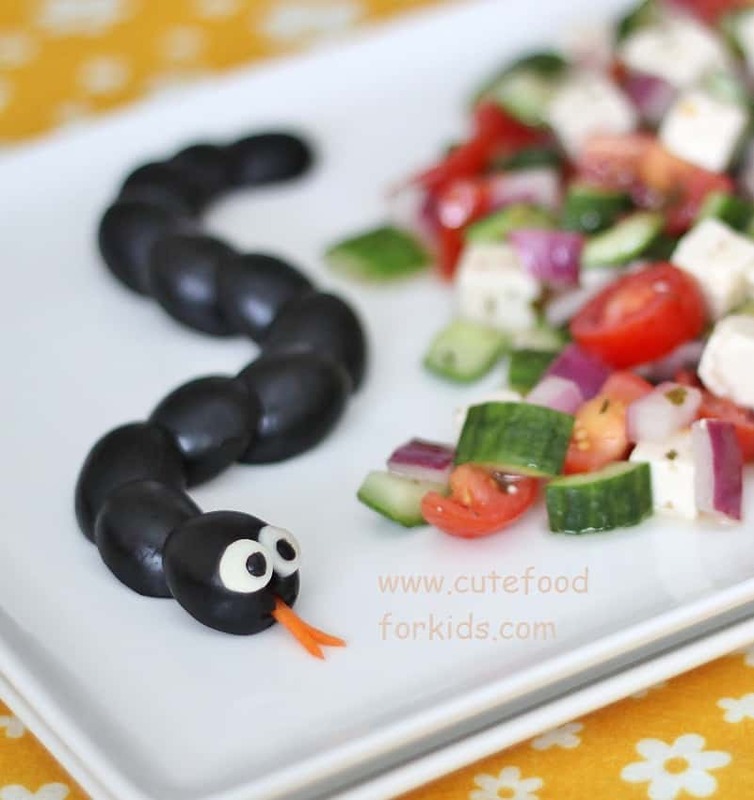 I am totally in love with that little Black Olive Snake. It’s so darling, I don’t think I could even eat it. 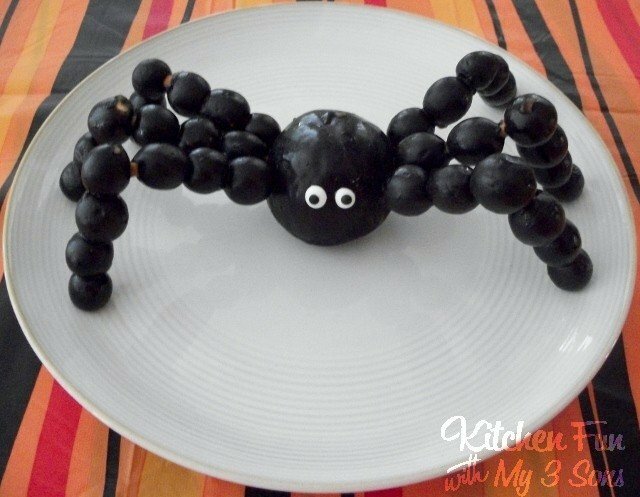 Such a delicious idea and fun project to do with the kids. 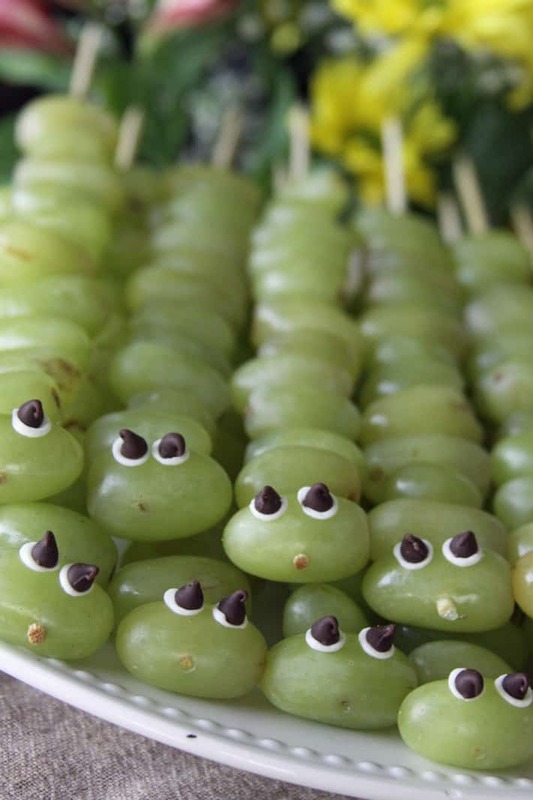 I strongly suggest that you replace the vanilla frosting with cream cheese, though, and chocolate chips with raisins or currants, to keep those sweet little green caterpillars on the healthy side! 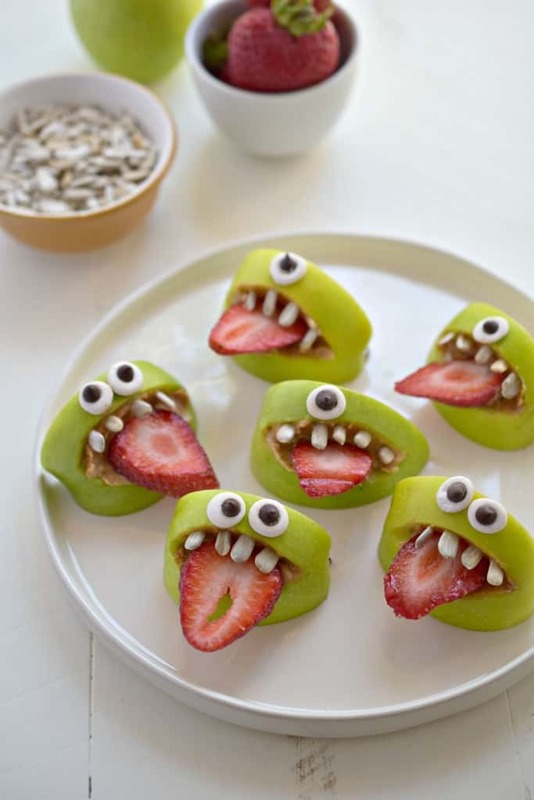 So silly indeed, those apple slices! And so adorable. I would definitely grab one or two from that tray! 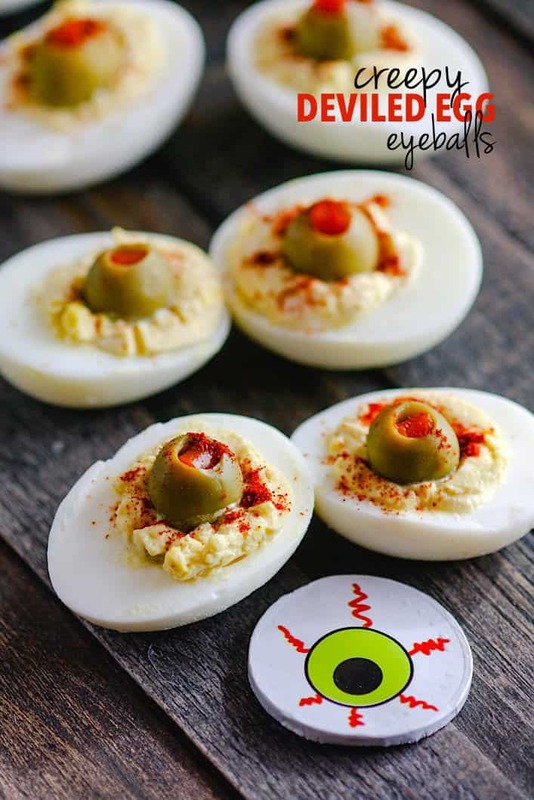 They even provide a recipe for the googly eyes, but I’m thinking that cheese and raisins or currents would make for a fab replacement and would be much faster to make! Or you could also make some out of white and dark chocolate. 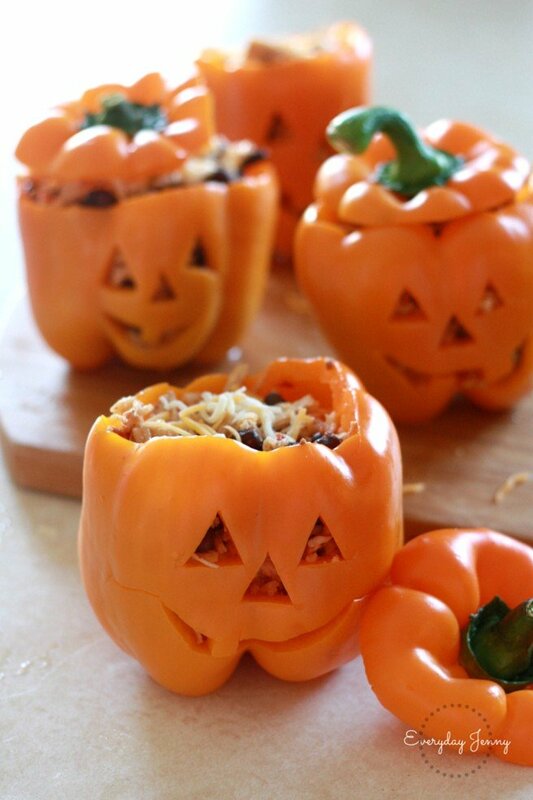 I think these would be absolutely perfect for a Halloween Pot-Luck. Although you wouldn’t find me anywhere near them, no matter how delicious they sound. They look way too scary for me! And these would creep me out even more!! The spiders, they look so real! 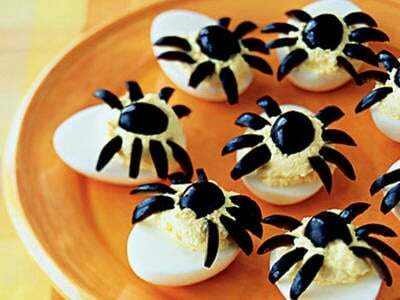 I can picture mischievous little boys scaring little girls by running after them, deviled eggs in hands… and little girls running around in circles, screaming their lungs out! This one I’m definitely putting on the menu this year! 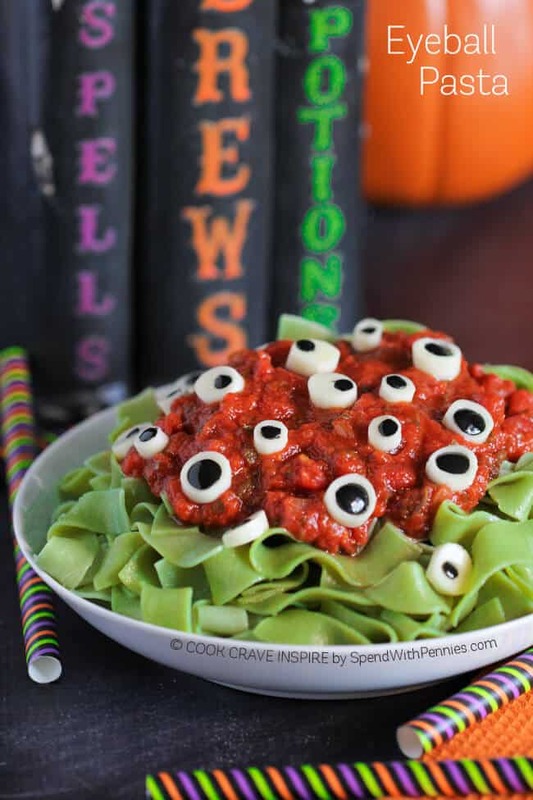 If you wanted to spook the kids a bit more, I’m thinking that this pasta dish would be a fantastic option. Just please, don’t invite me over for dinner that night… I’m not sure I could take it. 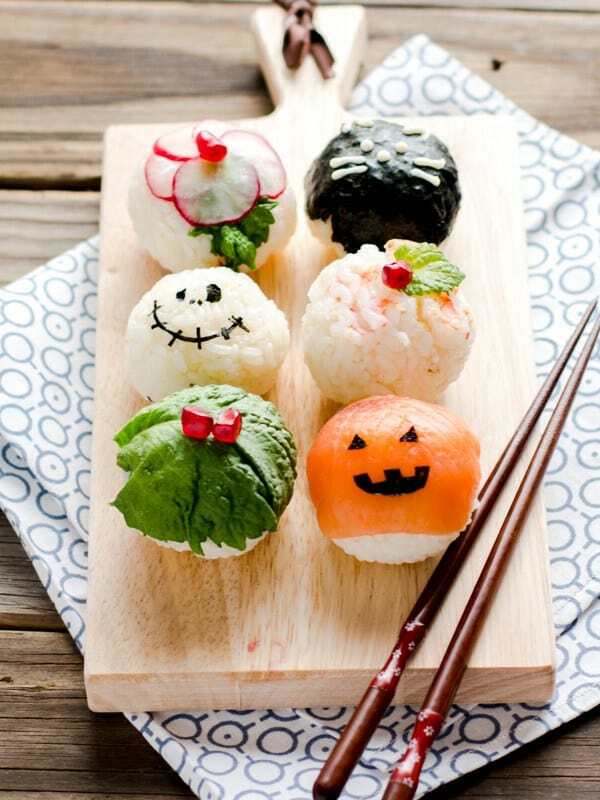 If you’re gonna make these adorable sushi balls, though, please feel free to extend that invitation! I’ll be like, RIGHT OVER! This pudding is intended for breakfast, but I’m thinking it would also make for a great dessert. 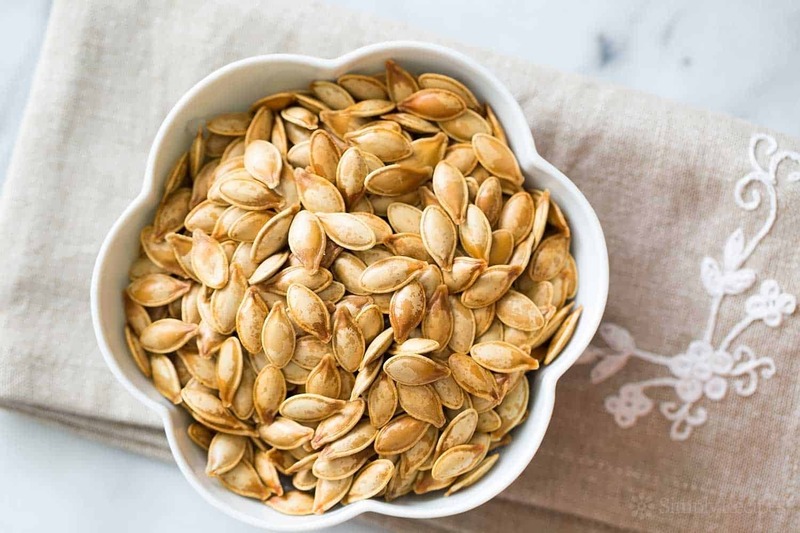 Way, way better than candy! 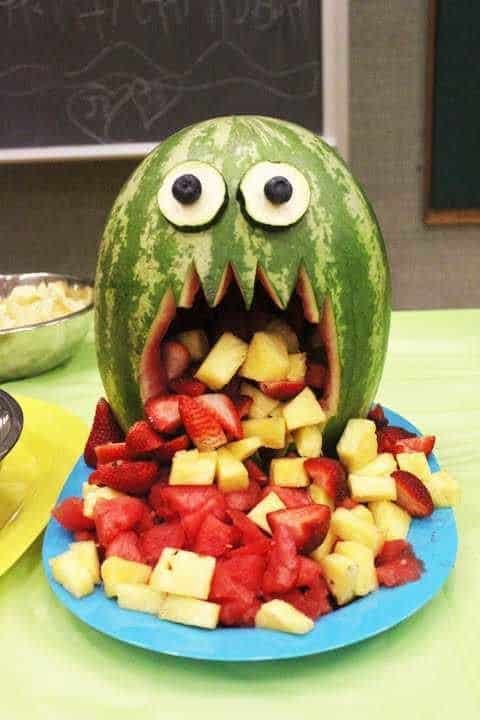 Now here’s a fantastic idea to serve fruit in a much more fun and fashionable way! At least now it has a bit of a fighting chance, next to all that candy! 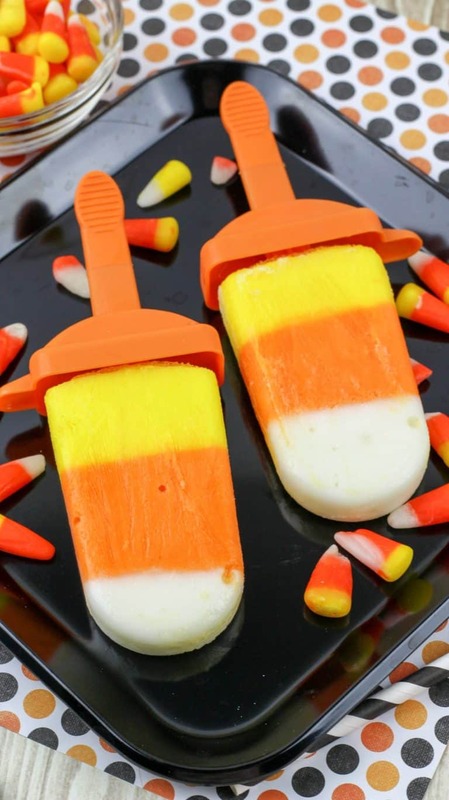 I never really got candy corn. I mean, I know it’s a classic and all, and a well beloved one at that, but it never did anything for me. Seriously: is this stuff supposed to be good? Whoa! Wait! Hold the tomatoes!!! I think maybe I’m not a fan because I’m from the wrong part of the world and it’s not really part of our heritage here. Totally not my fault. Strange, really because this picture is all over Pinterest. I’m guessing you’ve probably seen it before, but still; it’s just too brilliant not to be included here. 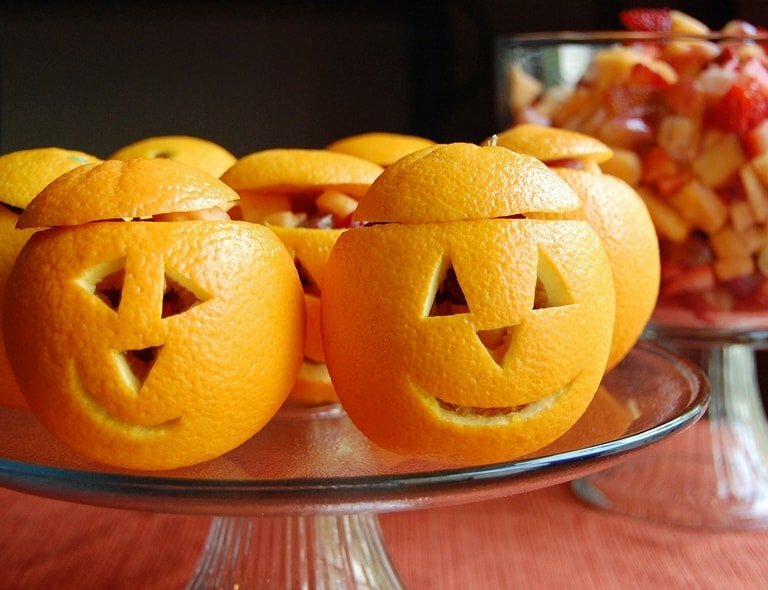 Bring this to your next Halloween party, you can be certain that it’ll be a major conversation piece!